Effective and economic electric grid asset management and incident management involve many complex decisions on inspection, maintenance, repair and replacement. 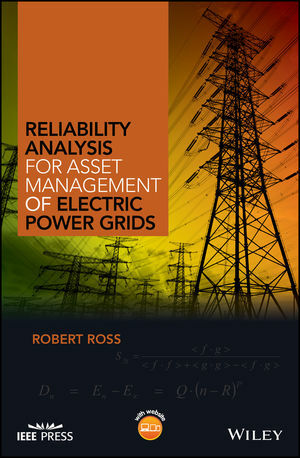 This timely reference provides statistically well-founded, tried and tested analysis methodologies for improved decision making and asset management strategy for optimum grid reliability and availability. The techniques described are also sufficiently robust to apply to small data sets enabling asset managers to deal with early failures or testing with limited sample sets. The book describes the background, concepts and statistical techniques to evaluate failure distributions, probabilities, remaining lifetime, similarity and compliancy of observed data with specifications, asymptotic behavior of parameter estimators, effectiveness of network configurations and stocks of spare parts. It also shows how the graphical representation and parameter estimation from analysis of data can be made consistent, as well as explaining modern upcoming methodologies such as the Health Index and Risk Index. Offers hands-on tools and techniques for data analysis, similarity index, failure forecasting, health and risk indices and the resulting maintenance strategies. End-of-chapter problems and solutions to facilitate self-study via a book companion website. The book is essential reading for advanced undergraduate and graduate students in electrical engineering, quality engineers, utilities and industry strategists, transmission and distribution system planners, asset managers and risk managers. ROBERT ROSS is a professor at TU Delft, director of IWO (Institute for Science & Development, Ede), a professor at HAN University of Applied Sciences and an Asset Management Research Strategist at TenneT (TSO in the Netherlands and part of Germany). At KEMA he worked on reliability and post-failure forensic investigations. His interests concern reliability statistics, electro-technical materials, sustainable technology and superconductivity. For energy inventions he was granted the 2004 SenterNovem Annual award and nominated 2006 Best Energy Researcher by the World Technology Network. This book is based on studies at KEMA and IWO, lectures at KIM (Royal Institute for the Navy), and experience with utilities.